Mecca Bingo is a name that many of you will know from the land based bingo halls dotted up and down the country and the internet bingo side bought to you by this renowned name doesn’t let the side down at all. 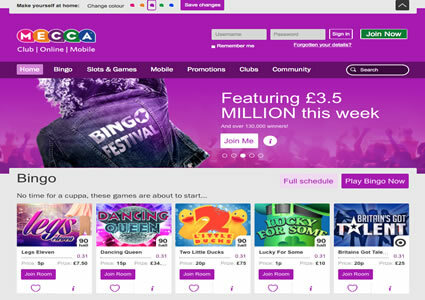 The homepage of Mecca Bingo is bright and offers easy navigation to all the latest news, promotions and game play available at their internet bingo site. In addition there is also a feature to find your local Mecca Bingo hall by simply entering your postcode. Registering an account with Mecca Bingo is simple to do and if you are a member at any land based hall from this site they even offer a look up service so that you need not enter all your details again. You do need to enter payment details during the registration process but no funds will be removed from your account until you choose to visit the online cashier at this internet bingo site. It is common knowledge that Mecca Bingo offer some great welcome bonuses to all new players at their online site, but the icing on the cake has to be their ‘Free Bingo for Newbie’s’ special. Here newbie’s (as they say) will have the opportunity to take part in a host of free bingo games which are only available during a seven day period after registration. No deposit is required to be eligible for these games and you’ll have to visit the Newbie room where all this action will take place. Opening hours are between 6pm and 9pm every day with jackpot prizes worth £25 a pop; not mention Mecca has even got ‘1 to go’ prize pools in place -almost everyone can be winner. As part of the well known Rank Group this offers a sense of security when you play at their bingo site; the bingo software used to power their bingo games is provided by Virtue Fusion and this means three varieties of the online bingo game are available. You can choose to play 75 ball bingo, either multi-part or multi-line, 90 ball bingo, speed or normal and also a firm favourite at land based bingo halls, 80 ball bingo which is better known as cash line to the avid bingo hall attendee. Also on offer from this internet bingo site is a huge array of casino style games, the usual games found on the VF platform are available like Lucky Ladies 88 and Clover Rollover but you will also find firm favourites like Monopoly and Cleopatra available too. 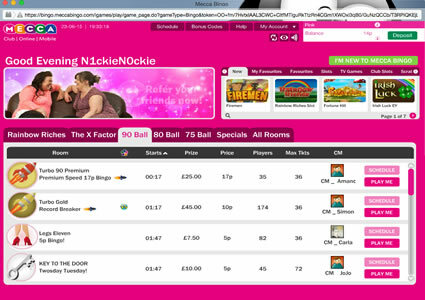 Mecca Bingo is definitely a site for the discerning internet bingo player and has some superb promotions on offer. Remember to keep an eye on these as promos come and go at this online site so you don’t want to miss out on chance of winning something special like their prize giveaways, bonus cash pots and even bigger jackpots. This brand constantly updating the number of rooms available to play in at their internet bingo site but a full list is available when you log in to their bingo lobby. 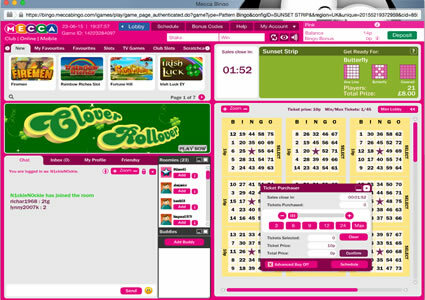 The different games available are separated into different tabs and each tab lists the rooms available showing their opening times, games played, number of players and the ticket prices. Players can also check the schedule for each room which is a handy function if you are looking for particular priced games. 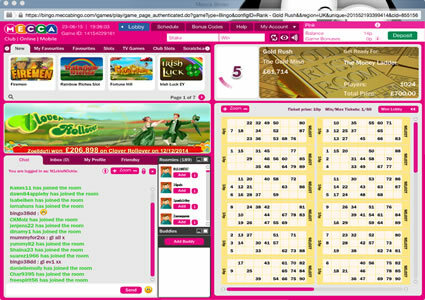 The site also offers the option to pre-buy bingo tickets for many games. You can also partake in a few mini games whilst playing bingo too. These are separate from the games available from the home page. You can access them by clicking the game you wish to play. You have the option to set your sounds and game quality and whether to auto sort and auto daub. Some of the bingo games at this internet bingo site offer you the chance to win an extra jackpot if you call bingo within a certain amount of numbers. This of course will vary depending on the room and the variant of bingo that you are playing so remember to check the details of each room before entering and purchasing tickets. A firm favourite amongst Mecca Bingo players has to be their Bingo Linx games which offer some astounding jackpots on a daily basis. Join in at 12pm for a £2000 jackpot game and at 6pm for a £3000 jackpot game; these take place daily. Alternatively get involved with the 10:30pm games for much larger jackpot games – from Saturday to Thursday £5000 will be up for grabs and every Friday, £10,000 shall be won in these networked bingo games. Obviously times are subject to change but with their pre-purchase option and tickets costing only 50p each you should never have to miss a game. The brand offers all players the chance to play bingo for free at their online bingo site. This can come in the form of the free games they offer or with the BOGOF specials they also run. Mecca Bingo is a fan of running themed promos too so you can expect some funky and original free bingo games to get involved with. As a member you can use your account details to play at Mecca Games which offers a multitude of casino style games to play, including Slots, Keno, Scratchcards and other Instant Wins.